Today, June 26th, Howard Schultz resigned as Executive Chairman of Starbucks (SBUX). At Toroso, through ETFs, we celebrate innovative thinking, entrepreneurship, and embrace business disruption. 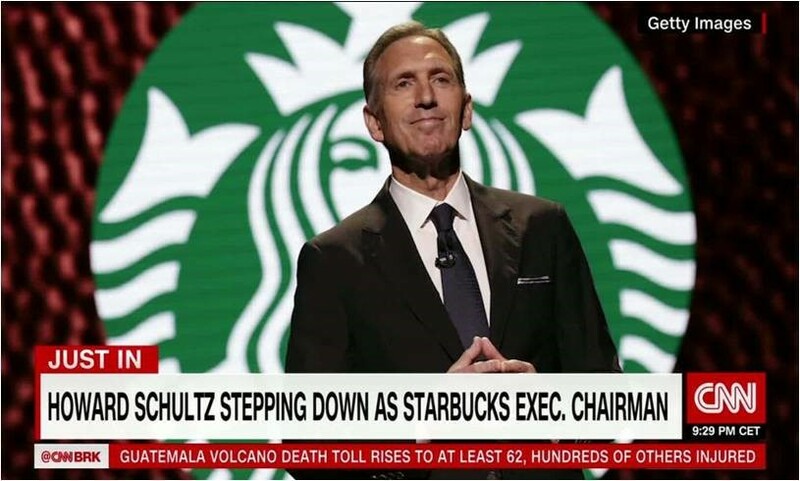 Without getting into politics, we appreciate Mr. Schultz’s decision although it comes at an awkward time for Starbucks shareholders. Starbuck’s just announced that it would be closing 150 stores and same store sales targets are now expected to grow by only 1%. Starbucks Shareholders may not all agree, but Howard Schultz for president is a good thing for all! Regardless of whether one agrees with his political views – having someone with his caliber will raise the bar and challenge the old guard! Schultz has confidence in Johnson as CEO and clearly sees his impact on his social mission as more important than that of extending the growth of the Company he built. His decision could not have been easy since when he left last time in 2010; the Company was in a vulnerable position as well. What does this have to do with ETFs? Two hundred ETFs own about 5.47% Starbucks (SBUX) which is not meaningfully close to the average of 7.5%. Moreover, as a tribute to the house that Schultz built, we note that this stock is overweighted in 10 ETFs (range 3.75% to 2.27%). Additionally, while heavily owned by passive rules based ETF strategies, the principles that Schultz represents are reflected by the ownership by ETFs that follow factors such as Quality and Growth. Noteworthy is the fact that Starbucks ownership is also concentrated in the consumer discretionary segment and divided between U.S. large cap and International ETFs. While the recent news proved disappointing, it will be interesting to see how all these numbers change after the next rebalance. Starbucks, despite decelerating growth, both raised its dividend 20% and positioned its buyback more aggressively in tandem with the news. Objectively – we would expect less growth should change SBUX qualifications in a few of these ETFs and will test what is meant by quality in a number of these ETFs. A 20% dividend increase by a Company with a solid balance sheet whose growth is slowing may not meet every ETF’s definition of “Quality.” The great thing about a passive rules-based-structure is it follows a disciplined strategy with human subjectivity. Result: caffeine and taste do not matter! The future direction of SBUX stock is precarious right now, but as a credit to Howard Schultz, we thought we would review how the Company is defined by its ownership by certain ETFs. As an example, the Starbuck brand is owned by ETFs that look for leading businesses whose products are defined by their reputation, ie. Vaneck Morningstar Wide Moat ETF (MOAT), Brandometry’s (BVAL) and Exponentials (ACSI). We could also highlight that millennials (MILN) love the brand and Schultz’s social mission, and this ETF therefore not coincidentally owns an overweighted position in SBUX. Make no mistake about it, Schultz’s social mission is also reflected in other social mission ETFs. SBUX is owned by the Insight Shares Patriotic Employer ETF (HONR) and many ESG and Impact investing ETFs, including the iShares MSCI KLD Social 400 (DSI) ETF. Mr. Schultz, as a pioneer for social change, has taught us a lot over the years including that doing the right thing can be accretive to economic value.